Presided over by always-dressed-to-impress Nancy Silverton, Osteria Mozza goes from strength to strength. 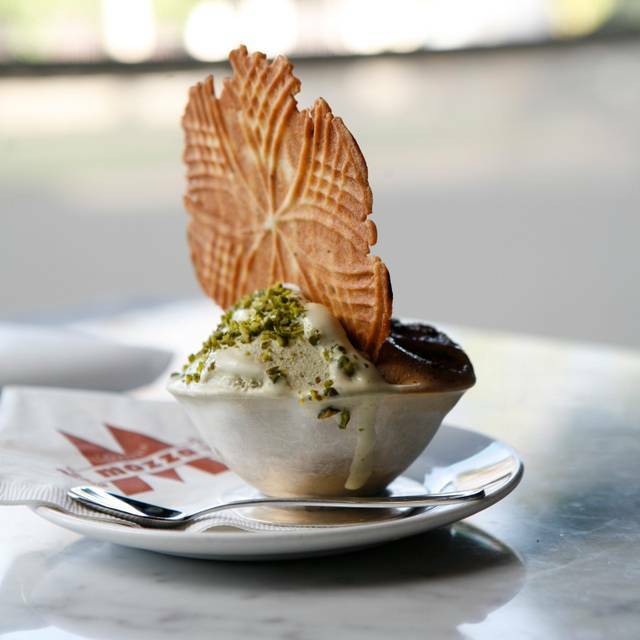 From exquisite handmade pastas to grilled beef tagliata to Pastry Chef Dahlia Narvaez’s rosemary olive oil cakes. Osteria Mozza’s is a menu Angelenos can recite by heart: the greatest hits. The all-Italian wine list continues the tradition by offering bottlings from the country's finest producers with a focus on Piedmont, Friuli and Tuscany. 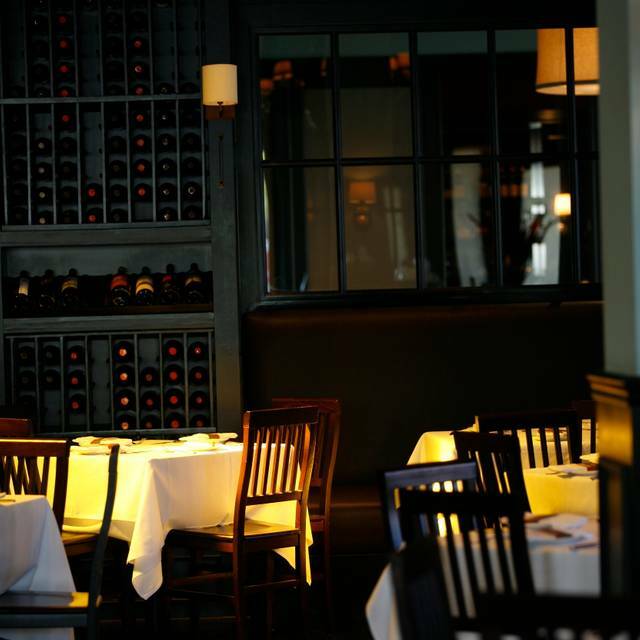 We offer our normal a la carte menu so our Mother's day diners can enjoy their favorite Osteria Mozza dishes. Book your table early to guarantee Mom has a great table at which to celebrate! 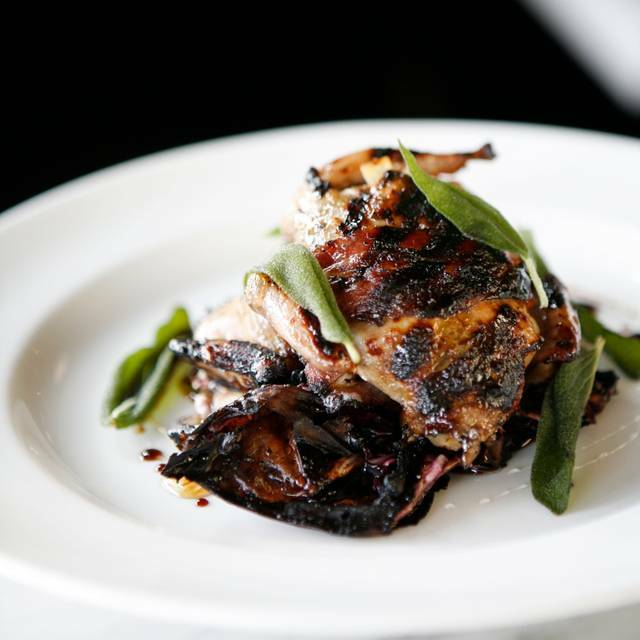 One of LA's finest Italian restaurants, Osteria Mozza in Hollywood is still very much at the top of its game. We sat in the quiet side room, the food was delicious, friendly and efficient staff. Great great service. Impeccable presentation. Very extensive Italian wine list. Attentive, but discrete, waiters. Went there to celebrate my birthday and a friend's bachelorette and it was one of the best experiences with food we've had, the service was perfect, the food and the wine exquisit. Heard about the chef on Chef's Table program on Netflix and it was the perfect choice. Everything was great, but they should work on their smell extraction. We got home smelling like very heavy food. Went here for my fiancé’s birthday. We say the chef’s table episode about it and have been wanting to go for years. Finally made it and it was worth it. The bambolini was to die for. We had to get to a play we were going to for my boyfriends birthday and I surprised my boyfriend to celebrate his 30th with Osteria Mozza, his first time. We informed our waitress of our time schedule to make it to the play in time and she completely took care of us and was so kind and made sure we made it to the play in time. I love this restaurant yes, for the outstanding food (which did not disappoint!) but for the service as well. It speaks for itself. The men who served our food, refilled drinks, and offered the amazing bread were so kind and very attentive. They all went up and beyond and were all very sweet. Can’t thank the cooks for the amazing food. The waiters and waitresses for their impeccable service and kind demeanor. And hostess for their warm welcome and sitting us quickly. It was my boyfriends first time at Mozza and he was completely floored. He loved everything right down to the ambiance and experience. Well done Nancy for this fine establishment. Can’t wait to come back! Unfortunately food was below average. The linguini Caccio e Peppe was tasteless, maybe my Mac&Cheese to my daughter has a more interesting taste. Octopus was overdone and goat cheese ravioli was too thick. Coming from a Italian family, my standards were way above. But ambiance was good. One of my favorite restaurants in LA easily. Food is amazing, environment is comfortable. I LOVE Mozza! I have to say that I was a bit disappointed in Osteria Mozza. I will admit that the food was very very good and generally worth it (perhaps with the exception of the $18 shaved brussel sprout salad). However, ambiance and service are key for me, and it lacked both. My husband and I went for our anniversary - which we noted on our reservation and when we called to confirm that day. However, our waitress was not made aware. We brought a split of special wine, but were told there is a $40 corkage fee. Honestly, I understand the corkage fee, and even the need to enforce it (even on a split), but the sommelier was pretty rude about it. We were starving when we arrived and tried to order a starter while we looked over the menu but were told that the waitress would only place the ENTIRE ORDER at once, then she walked away saying she'd give us more time. It was loud. Tables are tight. Manager never stopped by. Service has always been fantastic at the Pizzeria, so this was a disappointing first visit to the Osteria. Needed to be moved from first table selected. Second table was better location but too small for three diners. Plates were literally hanging off the edge of the table. The sommelier was very rude and desultory-basically reread the wine menu back to me with no suggestions or offers of tasting. Service completely dropped off for periods of time and dirty dishes sat in front of us for lengthy periods. Food was very disappointing for us all in comparison to a prior visit. There was literally nothing tempting on the dessert menu. We left and headed over to Baskin Robbins which hit the spot in both taste and service. We won’t be back. A great dining experience for the second time. We'll be back for sure! Food was delicious and the service was fantastic. Date night with the wife. Food was Amazing and the staff was very helpful except for the bread guy who just watched us. You’d think he would have offered more bread, but he just stood there. Our waiter was on top of it and the sommelier was courteous since we decided on a cocktail. Not a cheap date, but as stated earlier, the food here was amazing. Continues to be outstanding, with tremendous care in prep, incredibly vibrant and subtle flavors, and great service. Disappointing. Period. Really disappointing. We came from Toronto to experience Osteria Mozza and made reservations at least a month + in advance. While I was looking for parking they wouldn't seat my fiancee because I wasn't 'present' so they gave our table away. We were given the only option of sitting a the bar if we wanted to stay for dinner. I think that ruined the moment instantly. They tried making up for it by sending over the sommelier to offer us a complimentary glass of prosecco which didn't really improve the situation. 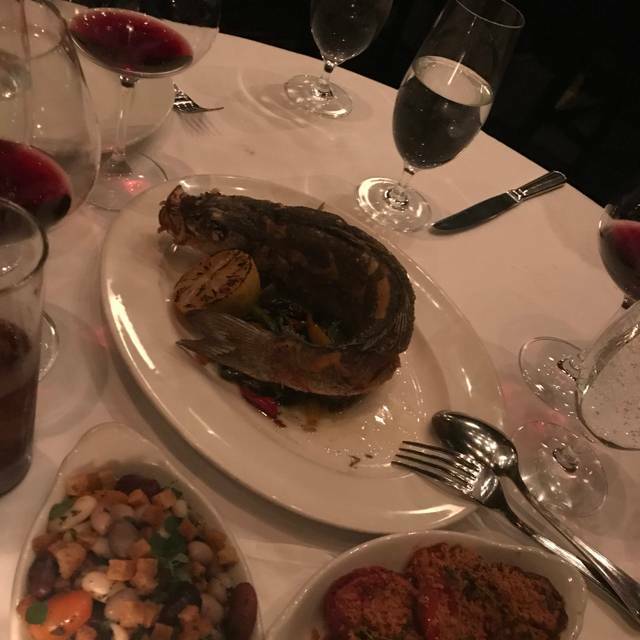 From that moment I wasn't about to spend as much as I would have which is probably good because our server was arrogant and the food was fair at best. We didn't even get bread which they served to all tables including diners at the bar but not us for some reason. I was expecting a lot more from this place. The entire experience was terrible. Too pricy for what you get. Not a lot of options for vegetarians. Small (I mean very small) portions. We basically ended up paying $150 for a kale salad and two pieces of mozzarella, oh yea and a $35 glass of wine that was of course chosen by our waitress. It’s over rated and was honestly very disappointed. Last note: WTF is the $14 valet for? Really??? Do you fill up my tank with that???? So mad! Everything was top quality. 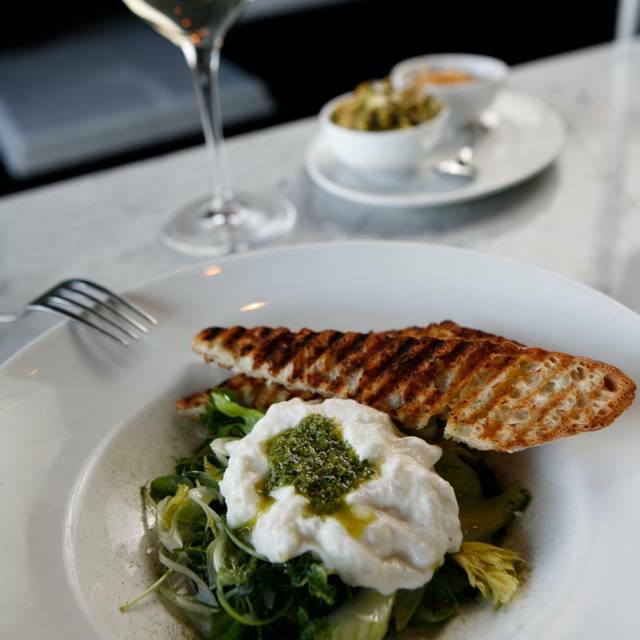 Burrata Pugliese was smooth, rich and flavorful. Orrechiette with Sausage was tasting with a hint of hotness. 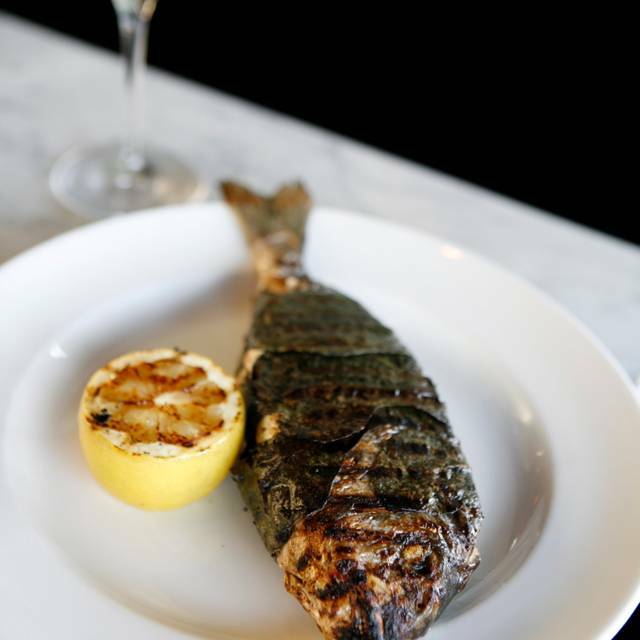 Branzino was fresh and large enough to share between two people...fried rather than the traditional grill was an interesting take. We skipped dessert because portions were generous. 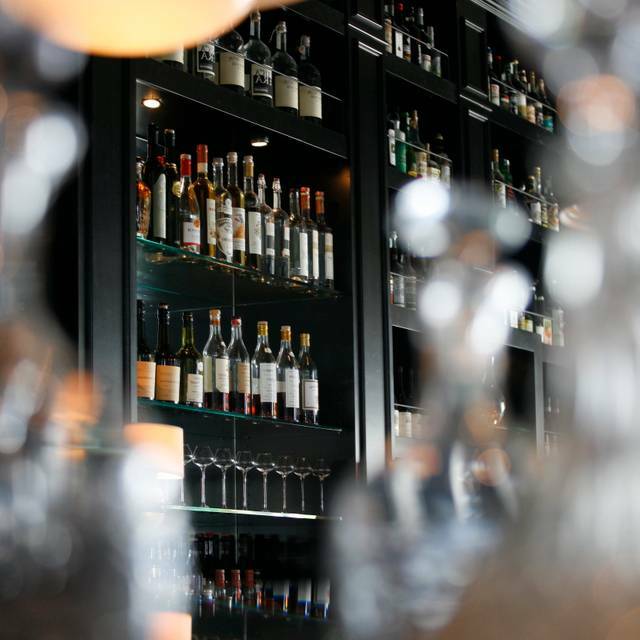 Wine list emphasizes Italian blends with a few champagnes for good measure. Very impressive and delicious experience. This very appealing physically restaurant no longer has the food to match. Actually, apart from their famous pizzas next door, they never really did. Their known name owner, Nancy Silverton, got her name in lights when she had a bread bakery, but we were never able to figure out why. She linked up with some big names and for the first couple of years we were caught up in the smoke and mirrors along with so many others who should have known better. Every time, we left saying that it must be that we just didn't know how to order there. 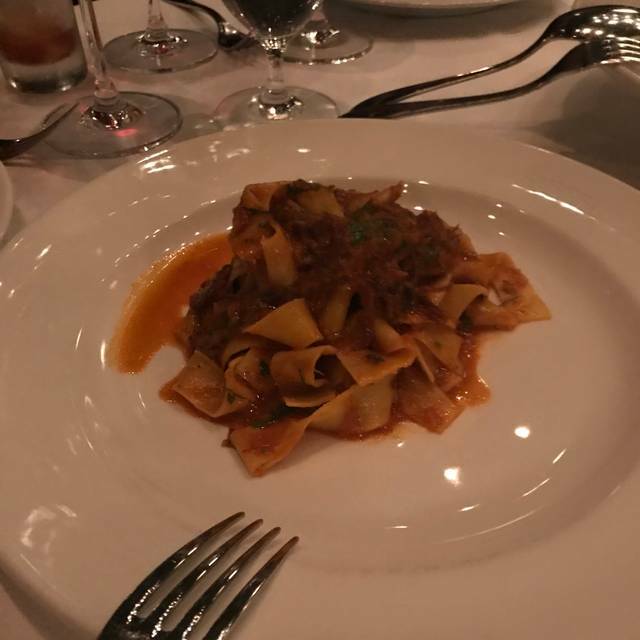 We have a long list of the dishes we have tried and rejected (like their oxtail concoction which made us gag at the taste and grab our water glasses) very mundane pastas, and a tiny list of first courses that we would order again. Even there, there were warning signs, like a $20 or so burrata with the texture of cottage cheese. The single talent they have their is a pastry chef so go there for a cappuccino - they've got to be able to make that right - and a dessert. You may wish to go here with the tourists for the environment, but go to Hippo or so many others for the huge food talent, like Milo and Olive for super food at about one third the price in a hip but not showy ambience. Also, no one is charging $30 per glass for wine any more except here, high end hotels, and one or two other tourist attractions like Spago - which, however, still has talent in the kitchen. Spago is expensive but is not a money machine like Osteria Mozza. If you can't resist having the experience of going here, you at least will have a good laugh comparing their prices with the better restaurants in L.A. However, if you actually order one of their so special dishes, you won't be laughing any more. It was a wonderful dining experience! Always a treat. Coming here makes me feel good about being shut out at Felix...again. Not a bad dish in the house. Nancy, these noodles were made for slurppin’. Food and service excellent. Appetizers good. Amazing Italian wine list. The sommelier selected the most perfect wine according to our preferences. Amazing wine. My fish was good but it’s hot on a cold surface with hummus. It makes the fish cold. All these years later it’s is still trendy, still impeccable food, and still busy... bravo! Food was all over salted and did not live up to expectations. Lightning is so dark it’s impossible to read a menu without a flashlight. we heard Pizza Mozza was great but our experience missed the mark. We were highly recommended here as San Francisco transplants to dine for a big birthday occasion/first la spot to eat. Unfortunately we were not very pleased with the service or food. We were hoping for more guidance when it came to pairing our food. It wasn’t a bad experience...just not what we were hoping for. I had a bug in my salad...understandable, given it is organic. Just not the best way to start off a coursed meal. We had a nice time and found positives throughout but unfortunately won’t be returning. All my best! Absolutely unreal on all accounts. Mixologist and sommelier were very helpful. Food was impeccable and the wait staff were knowledgeable and professional. Wine steward was excellent. The server, not so much. Fantastic food and Service! Best Italian restaurant in Los Angles. Have wanted to dine here for a while, definitely lives up to the hype. Great food and very good service. Osteria Mozza was great! The food and service were impeccable. My only complaint (and it was very minor indeed) is that when my date and I arrived to a nearly empty restaurant (they had just opened for dinner service) we were sat directly next to a party of 4 when there were plenty of other tables that would have offered a slightly more intimate date night experience. Otherwise, everything was on point! The menu is amazing! The service is also amazing. The wine list.... yep you guessed it, also, AMAZING! Been to the Pizzeria a couple of times and this was my first time trying Osteria and what an experience it was! The food was at another level and there's a reason why it's still tough to get a reservation at this place after all of these years. The atmosphere was great and the food was out of this world. You MUST try the Nancy's deconstructed Caesar salad, you simply will not believe how they can get so much flavor out of such a simple dish. Everything else we had tasted great too, from the Spaghetti Calabrese , to the asparagus, the different kinds of bread and of course the dessert! They had great Negroni's and naturally a great wine selection as well. This place is an absolute must and the price is on the reasonable side compared to other "high end restaurants" and definitely worth the price of admission! Dinner wasnt impressive at all. Brussel sprout salad was far too salty, mozzarella trio sampler lacked in flavor,my boyfriends pasta was just ok and sadly I didnt care for the octopus at all. Our second round of drinks took forever to recieve and his sazerack had far too much bitters. Overall, I was disappointed. Will continue to frequent Terroni DTLA which has far better cuisine and service at a reasonable prices. Wonderful Ambiance and Decor. Incredible wine list to pair with the michelin qualite cuisine. But most of all, its the high quality level of service. 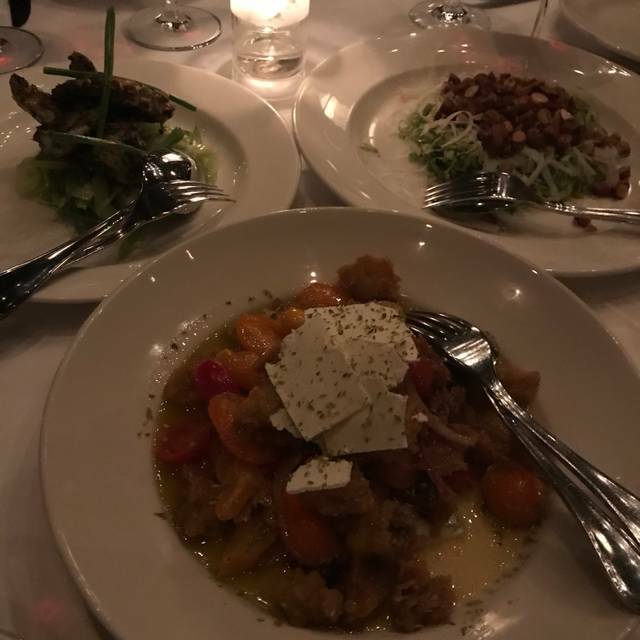 Always a pleasure to enjoy our special occasions at Osteria Mozza. It was fine. Service should have been better for the amount we spent. Nice pasta selection and great to share. Great food, even better experience. The sommelier, Dustin, guided me through their (huge) collection of Barolos, wisely suggesting a 2006 Vietti for early drinking, which we slowly savored sip-by-sip over the course of the dinner. Cannot recommend enough. Sommelier to the table, fresh bread served on a tray, delicious homemade pasta and great service.